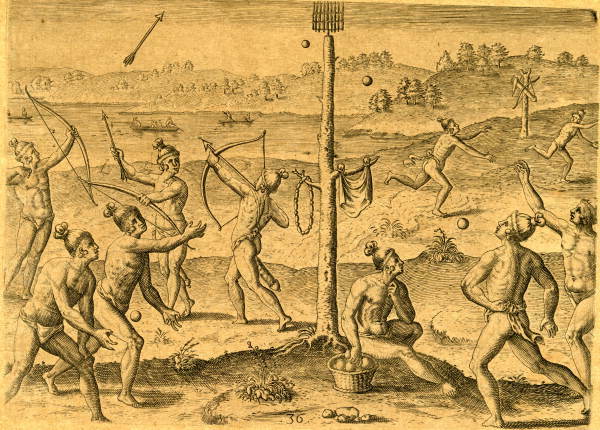 TIMUCUA BOYS AT PLAY — Kids will be kids: Timucua boys enjoyed several pastimes, including ball games, footraces, archery, and canoeing. In addition to being fun, these activities helped young people sharpen their skills for adult tasks. TIMUCUA GIRLS AT PLAY — Not much is known about how the girls spent their free time. Like some other Indian youngsters, they may’ve amused themselves by playing with dolls and playing house. This would have helped teach skills for future responsibilities. And if they proved similar to other Southeastern Indians, they might have also practiced the “Quiet Game.” This showed them how to sneak up on a duck or rabbit while hunting. MUSIC, TIMUCUA STYLE — The Timucua jingled a small tambourine to accompany their singing and dancing. They may have also played a type of panpipe or trumpet, crafted from a thick reed. In addition, they blew a flute-like instrument, shook gourd rattles, and pounded a flat stone with a club. FEMALE ONLY? — According to some historians, it appears that only Timucua women danced. Other researchers say that both sexes danced, but always separately.